Sally Run: Bruce rocks the half-Ironman in Knoxville! Bruce rocks the half-Ironman in Knoxville! We had a great weekend with the Fravel family while Bruce and Jared participated in the Rev3 Knoxville Half-Ironman. The guys did great - Jared finished 63rd overall (not sure of his age group results), and Bruce finished 7th in his age group and 33rd overall - not bad for their first time out at this distance! They are gearing up for the full Ironman this summer! 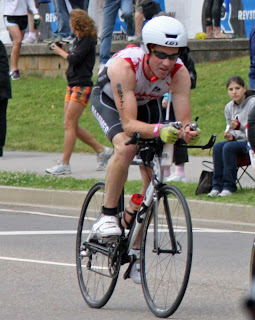 Bike and run were awesome, and the swim was less awful than expected. Bruce only got clobbered by arms and legs a few times and lost his watch in the river. I was very relieved to see him climb out of the water, as I am personally not a fan of these open swims in the river. Crystal and I had our own Ironwomen experience managing/schlepping 5 kids around downtown Knoxville to cheer for their daddies at each transition and finish. Luckily, they let kids run with their parents down the chute to the finish line - which made the previous 6 hours worth it!!! Bruce heading out for 56 miles on the bike. Jared returns from the bike stage. Bruce completes the final run stage (13.1 miles) and heads toward the finish line with the kids! Jared and his girls run toward the finish!